Except in some snazzy restaurants in Manila whose kitchens are run by foreigners or influenced by Filipino chefs who have trained abroad, I don’t think octopus is a common ingredient on local menus at all. But it SHOULD be. It’s an incredibly flavorful creature and it is proving reasonably easy to cook as well (I wouldn’t have said that up until last year, when it always seemed to turn out rubbery and tough when I cooked it). 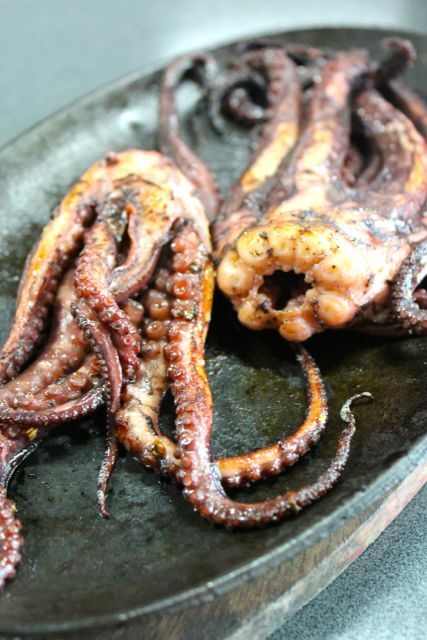 Many folks aren’t familiar with octopus, and when you say you are cooking some up for lunch, the vast majority are skeptical, despite the fact they have never bothered to try eating it before. At least that was the overwhelming reaction I got recently when I ordered several kilos of octopus from our fishmonger in Cebu and served it at the office for lunch. First, I braised several medium sized octopi in their own juices (along with some bay leaves, whole peppercorns and a touch of red wine vinegar) for roughly 50-60 minutes until tender. Then I seasoned them with sea salt, black pepper and dried red chilies and some olive oil and grilled some of them over an open flame briefly and sliced them and served it with a dipping sauce of soy and vinegar. A few other octopi I seared on a cast iron sizzling plate (photos above) which didn’t quite crisp the tentacles enough but they still tasted pretty darned good. The octopus was tender, flavorful and almost meaty. Something I think most people would really enjoy eating if they just got over the “eew they are tentacles” reaction! Thank you so much for describing how to cook octopus. I have always wanted to buy them but would hesitate for fear of gummy and inedible results. Would the procedure be the same if I want to add them to kinilaw or ceviche? Salamat po. These are the tentacles. What did you do with the heads? 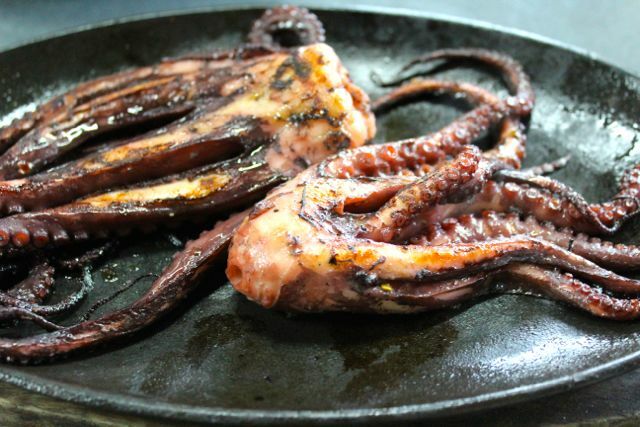 Saw on TV that Greeks beat their octopus to make it tender, did you do it too? No qualms eating tentacles here.. may tentacles din naman yung malalaking pusit di ba? Re: braising octopus in its own juices, do you mean to say, braise it with red wine vinegar ONLY until the octopus renders its own liquid? Can I buy octopus in any grocery in metro manila? I work 7 days a week and cannot seem to squeeze any time to visit the wet market. :( I have visited several weekend markets, but no vendor seems to sell octopus. Yes, just place in a heavy pot with a touch of vinegar and spices and put over medium-low heat covered w no added liquid. Octopus is not so easy to find in groceries but you will have more success at larger seafood markets like Farmers market in Cubao, Seaside in Baclaran or provincial mkts. Bet hay, the cooks cooked the heads as well but I don’t care much for the heads. I have previous octopus posts for more information on how to cook it. Greeks (at least here in Chicago) order boxes and boxes of baby octopuses from the Philippines. When I was still working at the Greek School and they had a fair, they served grilled octupos and I saw them delivered in several boxes. I wonder if they are cultured because how can you supply uniform sizes of seafood except by farming. Does someone know? I love the octopus and potato dish from Barcino… that and a bottle of red! Sounds easy enough… like cooking those large-as-an-infant squid! Yay, love octopus paired with beer. Thank you for the recipe MM. naku, MM…if you have any leftovers….slice thinly, add the ingredients of Mario Batali’s favorite sandwich … slice the boiled eggs, douse with BAGNA CAUDA…serve on toasted baguette slices. I am drooling for it is lunch time over here. Make sure though Mrs. MM is out of town when you eat this….GARLIC BREATH!!! Have parsley on hand to chew! It’s not commonly found on the dinner table because people tend to overcook them. It’s nice to see a proper way to cook octopus.